The annual Broadway Beauty Pageant has all their pieces in place! Jackie Hoffman, Tonya Pinkins, and Michael Musto are set to judge this year's pageant. Battling for the crown this year are Mamma Mia's Andrew Chappelle, Porgy and Bess's Wilkie Furguson III, Godspell's Corey Mach, Mary Poppins's Jesse Swimm, and Priscilla Queen of the Desert's Anthony Wayne. Tovah Feldshuh will host the night's festivities which will also feature performances by Brent Barrett and part Pageant winners Franke James Grande, Michael Cusumano, and Anthony Hollock. 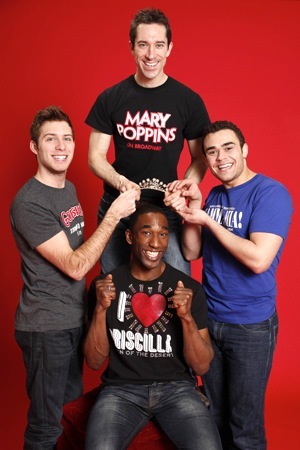 The Broadway Beauty Pageant, set for Monday, March 19th, will benefit the Ali Forney Center. The Broadway Beauty Pageant is written and conceived by the very talented Jeffery Self and directed by Ryan J. Davis, with musical direction by Christopher Denny. Tickets for The Broadway Beauty Pageant are available at www.SymphonySpace.org. Who are YOU rooting for?? ?